The next day, Leiphardt was high above Santa Barbara in a World War II aircraft, completely amazed even though she herself is a recreational pilot. To repay her new friends, she baked her way into their hearts with strawberry pies and instantly became part of the team. Today, the 55-year-old Happy Camper Child Care manager — who is also chapter chair of The 99s, an international women’s pilot organization — volunteers as the regional PR coordinator for the tour, which flies into the Santa Barbara Airport this weekend, May 1-3. Funded by the Collings Foundation, Wings of Freedom is a “living history” experience that hits 110 cities in more than 35 states each year, offering visitors the chance to step inside and even fly in vintage WWII aircraft. Excelling as spokesperson, Leiphardt took Santa Barbara from being one of the least-visited tour stops in 2013 to one of the top 10 most successful in 2014 and is also coordinating the San Luis Obispo stop this year. The role comes naturally: Leiphardt’s father served as a captain in the United States Army and met her mother, who grew up in besieged Belgium, during the war. That gives Leiphardt a unique sense of compassion for both the pilots and the veterans who visit. Vets often “come full circle” on the tour, which can be quite emotional. One elderly vet even mistook Leiphardt for one of his long-lost flames from the war days. “He said, ‘I really missed you, and I love you,’ and he started to cry,” she said. “Of course I’m not going to question him; I’m going to live in his mind for a moment.” When he asked for her autograph, she instead penned a short love letter, saying, “Dear Edwin, thank you for your service.” “He was just so happy,” Leiphardt said. 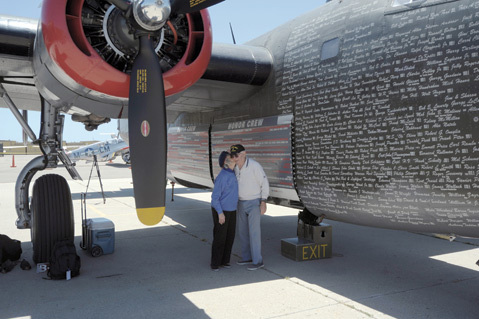 The Wings of Freedom Tour brings the B-24, B-17, and P-51C planes to the Santa Barbara Airport on May 1 (2-5pm) and May 2-3 (9am-5pm). Tickets are $12 for adults, $6 for children, and free for veterans. Half-hour flights in the B-24 and B-17 are $450 per person. P-51C flights are $2,200 for 30 minutes and $3,200 for an hour. See collingsfoundation.org or call (978) 562-9182 for flight reservations.